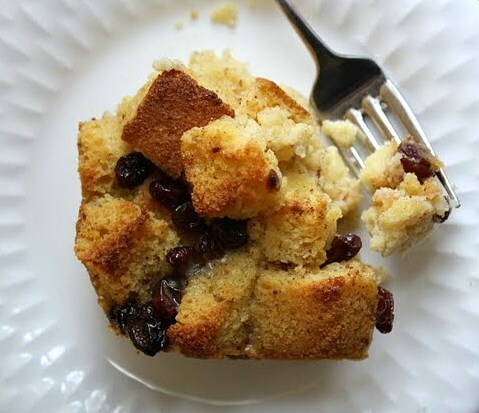 Jane's Sweets & Baking Journal: Sweet Corn Bread Pudding with Raisins, Cinnamon, and Maple Syrup . 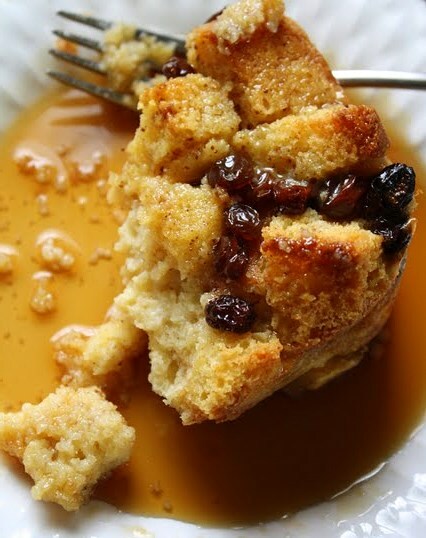 . .
Sweet Corn Bread Pudding with Raisins, Cinnamon, and Maple Syrup . . .
Winter rages on and it's a frosty world out there. The sort of world that calls for big pots of chili, simmering endlessly on the stove, and shiny pans of homemade corn bread puffing up in the oven. Last weekend, that scenario described my kitchen to a T.
For a lunch meeting to be held at my church that Sunday, I cooked up just such a batch of steaming red chili, enough for about 40 people. Along with it went an equally hefty batch of fluffy, sunshine-yellow corn bread. What I didn't know, however, was that another couple also planned to provide a significant amount of food for the same event. I'd had a nagging suspicion that this might occur, but ignored it and didn't take the initiative to check it out first. No matter. It all worked out fine, of course, and the leftover chili -- about half of what I'd brought -- was poured into zip-loc bags and tucked into in the church's large freezer for future use. The corn bread, though, didn't seem to me worth freezing. Not because it wasn't good. It was, in fact, a credit to its bready race--nicely moist, slightly sweet and, frankly, kind of hard for me to resist. But corn bread is one of those things, not unlike biscuits, that are only appealing eaten out of hand when incredibly fresh. Don't you think? After all, isn't it a widely accepted fact that corn bread's natural destiny is to dry out, crumble apart, and blow away like top soil in a dust storm? In light of that harsh reality, I took two bags of the big, soft chunks home with me. This time, I pledged silently, I wasn't going to end up tossing it all in the garbage can. But other than using the stuff once or twice for poultry dressing in the past, I'd never explored surplus corn bread's potential. This time had to be different. There was far too much of it to toss into the trash guilt-free. So I schemed. And that's how this warm, comforting, corn bread pudding recipe was born. Is it a dessert? Yes. Is it a fabulous brunch item, sort of breakfasty in its own way? Oh, yes to that, too. It's whatever you want it to be. Go ahead . 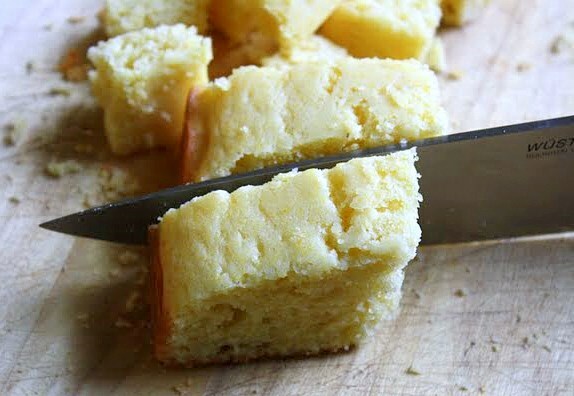 . . explore the leftover corn bread possibilities. You won't be sorry. And your garbage can will thank you. Lightly grease an 8" x 8" or 9" x 9" baking pan. In a medium size bowl, whisk together the dry ingredients. In a smaller bowl, whisk together the liquids. Pour the liquids into the dry ingredients, and stir just to combine. Pour the batter into your prepared pan, and bake for about 20 minutes or so, until the top is lightly brown around the edges and a toothpick inserted in the center comes out clean. Cool on a rack, in the pan. Lightly butter a deep casserole dish, approximately 9" x 9" or so. (A clear glass dish is your best bet for this.) Preheat oven to 325. Spread the cubed corn bread out on a half-sheet pan (the kind with shallow sides), and put it in the 325 degree oven for about 15 minutes, until it feels dry but not until it looks toasted (it doesn't need to "color"). Remove it from the oven and set it aside to let it cool. In a medium size mixing bowl, whisk together well the milk, cream, eggs, and maple syrup. In a small bowl, mix together the sugar, cinnamon, and salt. Add the sugar mixture to the liquids and whisk briskly. Pile the cooled corn bread cubes into your prepared casserole dish. Sprinkle the raisins evenly over the cubes and tuck them in here and there so they're not just on the top of the pudding. Pour the liquid slowly over the cubes, taking care to make sure none are left completely dry. Lightly pat the top down a bit to help ensure every cube will absorb some of the liquid. Let the pudding sit for 15 minutes or so before you put it in the oven, again to ensure that it has a chance to absorb the liquid. Bake the pudding for approximately 60 minutes, until the top looks toasty and golden, and the bottom shows some golden color as well. The middle of the pudding should be wet but not jiggly. Check on the pudding about halfway through the baking time to be sure the top's not browning too quickly. Cover the top lightly with foil if that's starting to happen. Cool the pudding on a rack, and serve it from the pan while still warm, each serving drizzled with a little maple syrup, if you like. Be sure to store any leftovers in the fridge. 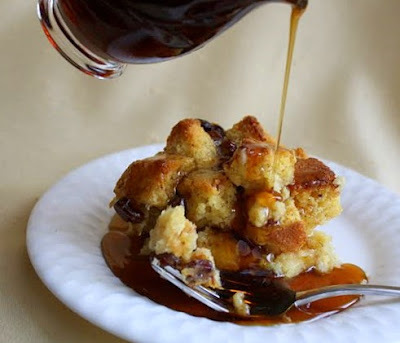 I love cornbread and I love bread pudding!! Great idea to put them together. This looks so yummy. What a brilliant combination. I've always loved (to eat and to bake) corn bread and corn muffins, and I also love and have made my fair share of some tasty bread and butter raisin pudding (a big thing in the UK and Ireland), but I've never thought to put my love of corn bread and bread pudding together. Perfect for one another. Thanks for this, Jane. I'm going to try out this recipe very soon (3 of the 9 pounds gained over the Christmas/New Year food frenzy are now gone, so hopefully sooner rather than later can I treat myself and himself to this dee-lish sounding (and looking) heavenly treat. 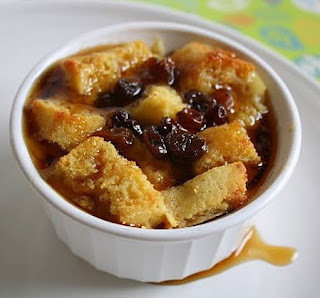 I never cared for bread pudding much. Only attempted to make it once and hate it :-( although this one looks really yummy and I bet the raisins add a nice touch. How is pastry school coming along? Great use of the bread, with maple syrup I am in love. What a gorgeous way you've presented this...I think I'd have this at breakfast. Wait no, anytime would do; you're right. Just what the doctor ordered Jane. I don't think I've ever indulged in corn bread pudding but by the looks of yours, it sure seems like I'm missing some mighty fine goodness! Ohhh, this sounds like a fantastic idea for cornbread. Who knew that it could be made into such a sweet treat. I have a linky party on my blog every week called "Sweets for a Saturday" and I'd like to invite you to stop by tomorrow and link this up. 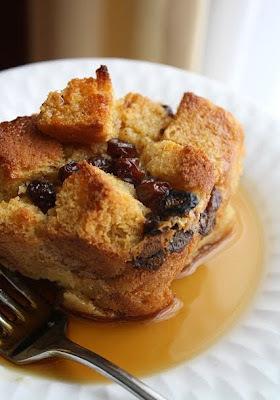 Wow looks fabulous and perfect for brunch or an indulgant weekend breakfast. I've only made cornbread a few times and found it a bit fry after a couple of days, now I have the perfect recipe for the leftovers. Looks so good! Oh my gosh, what a fabulous idea. 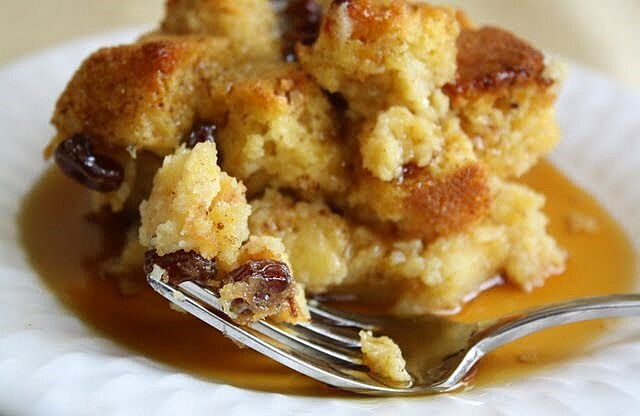 I would never have thought of using cornbread in bread pudding. I happily use most sweet breads, but what a great twist, Jane! My stash of freezer cornbread is getting pretty big! 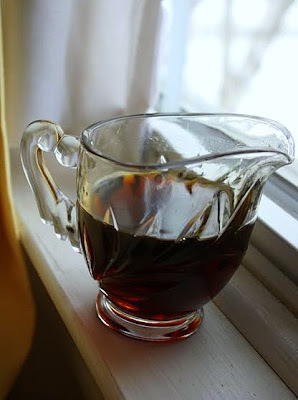 I love your recipe idea - definitely going to try this. Thanks for a great recipe. I cook lunch once a week at our senior center and have pans of leftover cornbread in the freezer and needed a recipe to use some of it up. Our seniors love bread pudding and I bet this would also go over well. At any rate, I'm going to try it soon. And when I do I will post about it, and link back here. Delicious. I didn't have raisins so I used craisins. Oh and gluten free corn bread. Perfection!